You have to pass the CSSBB exam to receive the certification from ASQ. To increase the effectiveness of your study and make you familiar with the actual exam pattern, we have prepared this sample questions. Our Sample ASQ Certified Six Sigma Black Belt Practice Exam will give you more insight about both the type and the difficulty level of the questions on the ASQ CSSBB exam. However, we are strongly recommending practice with our Premium ASQ Certified Six Sigma Black Belt Practice Exam to achieve the best score in your actual ASQ CSSBB Exam. The premium practice exam questions are more comprehensive, exam oriented, scenario-based and exact match of ASQ Certified Six Sigma Black Belt exam questions. You can easily pass ASQ Six Sigma Black Belt (CSSBB) Certification with the help of our online practice exam. We are here to help you every step of the way to pass your Certified Six Sigma Black Belt exam. Our team of experienced and certified professionals with more than 12 years of experience in the field of Business Process Improvement has designed practice exam to prepare for ASQ CSSBB certification. They have carefully maintained exam structure, syllabus, time limit and scoring system same as the actual ASQ Certified Six Sigma Black Belt exam. Our ASQ CSSBB question bank contains most frequently asked and real-time case study based questions prepared by collecting inputs from recently certified candidates. To get familiar with our online ASQ Six Sigma Black Belt certification practice exam environment, we invite you to try our sample practice exam to build the trust between us. I am from a small town in Persia. My parents desired to see me succeed and earn name for my family. 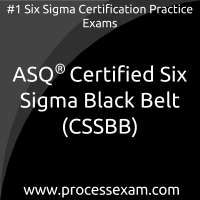 I decided to prepare for ASQ Certified Six Sigma Black Belt (CSSBB) Certification exam. I was feeling lost in middle as i did not know how to prepare. That’s when i came across processexam site. It is very good for us who have no idea how to prepare. It made me practice the mock tests on a regular basis and also gave me results. It is very good site friends. Please visit it and you will know the difference.